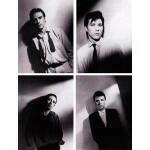 Ultravox (earlier stylized as Ultravox!) were a British new wave band, formed in London in 1973 as Tiger Lily. Between 1980–86, they scored seven Top Ten albums and seventeen Top 40 singles in the UK, the most successful of which was their 1981 hit "Vienna". From 1974 until 1979, singer John Foxx was frontman and the main driving force behind Ultravox. Foxx left the band in March 1979 to embark on a solo career and, following his departure, Midge Ure took over as lead singer, guitarist and frontman in October 1979 after he and keyboardist Billy Currie worked in the studio project Visage. Ure revitalised the band and steered it to commercial chart success lasting until 1988, at which time the group disbanded. A new line-up, led by Currie, was formed in 1992, but achieved limited success, with two albums failing to chart and one solitary single reaching 90 in the UK Singles Chart. The band's best-known line-up of Currie, Ure, bassist Chris Cross and drummer Warren Cann reformed in 2008 and performed a series of reunion shows in 2009 and 2010 before releasing a new studio album, Brill!ant, in May 2012 which reached 21 in the British Album Charts. In November 2013, Ultravox performed as special guests on a four date UK arena tour with Simple Minds. These shows proved to be Ultravox's last, as in 2017 both Currie and Ure indicated that Ultravox had run its course.